With part of the original 1918 Organization House at its entrance, the Wigwam Arizona maintains its elegance and history. In an early February ritual more than a century old, Major League Baseball’s pitchers and catchers report to Spring Training, soon followed by position players and ardent fans. Competing in Florida’s Grapefruit and Arizona’s Cactus Leagues, players get reacquainted with fundamentals and work into shape. Fans, often from bone-chilling Northern climes, thaw out, and luxuriate in warm surrounds. For aficionados of teams training in the Sonoran Desert, there may be no better place to report on February 12 than the Wigwam, a historic resort and hotel in the West Valley city of Litchfield Park. With preseason games held through March 27th, the Wigwam Arizona is one of spring baseball’s best outposts. Just 15 minutes from downtown Phoenix and a half hour drive from Sky Harbor Airport, it’s less than an hour from most Cactus League stadiums, including the relatively nearby homes of the Cincinnati Reds, Cleveland Indians, Milwaukee Brewers, Chicago White Sox and Los Angeles Dodgers. And while there are other hotels closer to several training sites, few in the Valley of the Sun can match the Wigwam for its complete package of amenities. Indeed, featuring three, excellent 18-hole golf courses, nine tennis courts, three swimming pools, a luxury Red Door Salon and Spa, a fitness center, three award-winning restaurants, and 29 fireplaces and fire-pits, the 331-room property is an indoor and outdoor oasis. 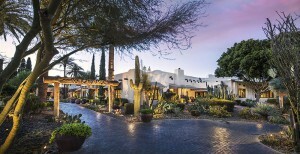 With a Western motif befitting the region’s cattle-ranching origins – – including an old stage coach that’s still used for rides into the sunset – – the Wigwam is nonetheless a thoroughly modern hotel, set up to host large business gatherings, weddings and golf tournaments, while also catering to individual needs. The Goodyear Blimps spent considerable time at the Wigwam, providing rides for guests. well being of millions, while building a rich company culture not often replicated in the 21st century. Today’s Wigwam, Litchfield Park and much of West Valley development is the legacy of the Goodyear Tire and Rubber Company. In 1916, the Akron, Ohio-based firm began using long-staple cotton to reinforce its pneumatic tires. Although only geezers will recall visible cotton threads in balding tires – – which dramatically fell in popularity after World War II, eventually replaced by rayon, nylon and steel – – the threads improved the durability of tires and softened rides. Also known as Egyptian cotton, the durable material was vital to the burgeoning demand for Model T’s and mobility provided by private automobiles. From the past until today, the Wigwam’s stage coach greets guests at the resort’s entrance. At the time, however, the only good sources were from Egypt, of course, and coastal islands off George, distances that made the economic success of Goodyear’s products sensitive to soaring high-quality cotton prices. That same year, Goodyear Executive Paul Litchfield, who later became the company’s president and board chairman – – and namesake of the surrounding city – – discovered that Arizona’s Salt River Valley, with dry and sandy soil, “appeared to offer the ideal Nile-River-like conditions to grow long-staple cotton.” When local farmers didn’t respond to Goodyear offers to buy the new crop, the company purchased 16,000 acres for its own farm and planted its own cotton. Supply chain issue solved. The original Organization House fireplace is still part of the Wigwam. Two years later, Goodyear built the “Organization House” on the property, as lodging for ranch suppliers. 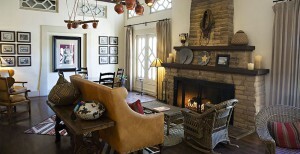 With second story rooms for only a handful of guests, the main living area featured a cozy fireplace. And soon, an increasing number of corporate executives found cause to inspect the farms, and brought their families in the midst of Ohio winters. The company expanded the structure and in 1929 opened it as a guest ranch with room for 24 visitors, and formally named the facility The Wigwam. The hotel thrived as an corporate outpost, and a new Arizona town was named Goodyear. A nearby company airport served flights ferrying executives to the Wigwam and beyond, the planes emblazoned with the company’s logo. Goodyear blimps spent part of their year based in the gentle Arizona weather, and the company also used the area for testing new blends of rubber tires. By the start of World War II, the resort expanded to hold 110 guests. In 1930, the Wigwam opened a nine-hole golf course, the start of one of the resort’s most popular and enduring activities. Five years thereafter V.O. “Red” Allen expanded the Wigwam course to 18 holes, and became the resort’s first golf professional. In 1965, Robert Trent Jones Sr. came in to rebuild the original and create a new 18-hole track, which are now named the Blue and Golf courses. More parkland than desert layouts and not terribly long, the course are still challenging. Indeed, the Wigwam greens feature sweeping contours, with small perches on which to locate holes. Several holes on the Gold are bisected or flanked by an irrigation channel, which for the unwary attracts and sink errant shots. But the primary defense here, and it’s formidable, are the rolling putting surfaces. 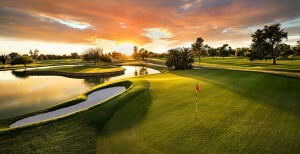 Better yet, there are few houses near the generous fairways, a gracious aspect of relatively few Arizona courses. Last December, the Wigwam hosted and served as base camp for the 16th Annual Media Golf Classic, which brought together more than 70 golf writers from around the world, including myself. 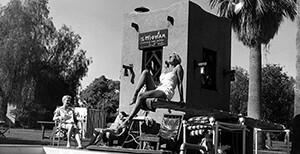 While the event has been held in exceptional locations in Scottsdale, Tuscon, Palm Springs and Mesquite, Nevada, nearly all of the writers proclaimed the Wigwam their favorite resort of all Classics. Ponds, a canal and wickedly canted greens defend the three Wigwam Courses. With the advent of the nearby Luke Airfield during World War II, the Wigwam’s rooms were leased to the military. The relationship between the Wigwam and the Air Force remains tight, in part thanks to a jointly sponsored golf tournament for leading college golfers, that also benefits and honors wounded and departed warriors and their Gold Star families. At the Wigwam, one has to be comfortable with the “sound of Freedom,” as it’s in the flight path of fighters leaving and returning to Luke, a loud but ever-entertaining sight. While the resort has had a couple of owners since Goodyear, the current ownership group is led by Arizona sports legend Jerry Colangelo, former owner of the NBA’s Phoenix Suns. His JDM partners purchased the resort in 2009 and immediately poured $7 million to rejuvenating the property. Great pains were taken to replicate the architecture of the Organization House, part of which remains at the entrance to the main lobby, including the original fireplace, a great place around which to gather after Spring Training games.